Heat the oven to 350°F. 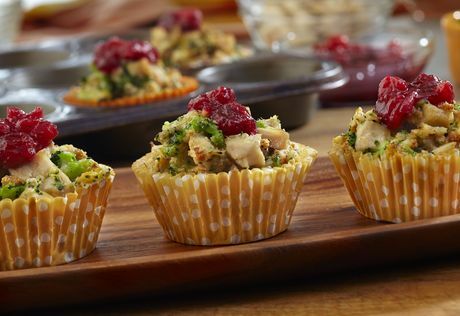 Place paper liners into 12 (2 1/2-inch) muffin-pan cups. Stir the chicken, stuffing, broccoli, soup and cheese in a medium bowl. Spoon about 1/2 cup chicken mixture into each muffin-pan cup. Lightly press the chicken mixture down so it's level. Bake for 25 minutes or until the chicken mixture is lightly browned. Top each with 2 teaspoons cranberry sauce.